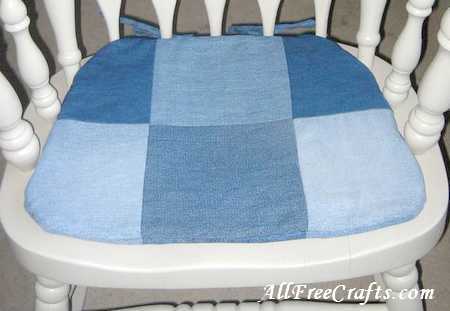 How to sew your own long-lasting, patchwork chair pads from squares of denim cut from blue jeans. This is a great little patchwork project and an ideal way to learn how to make patchwork denim fabric from squares cut out of blue jeans. Once the fabric is pieced together, you can use it for purses, quilt tops or other patterns. 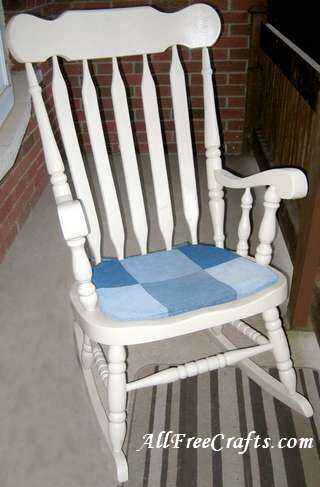 In this case, I wanted to make a new chair pad for the freshly painted rocking chair on my front porch. If I had an existing pad then I would simply have followed that pattern and recovered it in the pieced denim fabric. However, this time around, I had to make my own pattern from scratch, so I took pictures along the way to share it with you. the edge of the newspaper to curl up where it meets the spindles of the chair frame. 2. 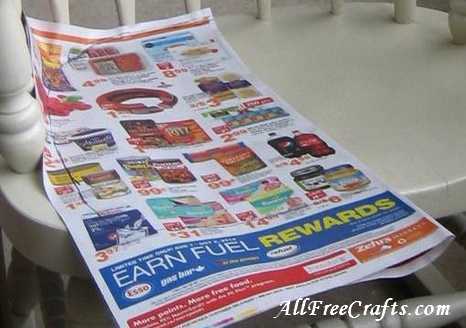 Draw a pattern on the newspaper making it as close to the shape of the chair as you can with rounded corners as you go from the back to the side and from the side to the front. 3. Cut out the paper pattern then open it up and place it on the chair for a test fit. Does it look the right shape? Is it deep enough and wide enough? You will want the chair pad to fit snugly just inside the chair spindles without being cramped. 4. Refold the pattern and redraw the lines to include a seam allowance and padding allowance. If you are using thin foam or quilt batting (or trying what I did, which is lining the pad with three layers of fleece), you can add a 5/8 inch seam allowance all around the pattern, but actually sew 1/2 inch or 3/8 inch seam, thus allowing ease for the padding. d the pattern. So, for a cushion with upholstery foam inside that is two inches deep, add one inch, plus a half inch seam allowance, or 1-1/2 inches, all around the pattern. Because you will be cutting and sewing two pieces of fabric this size, you will actually be adding two inches so the depth will be correct. Ok, I confess, I cheated here. 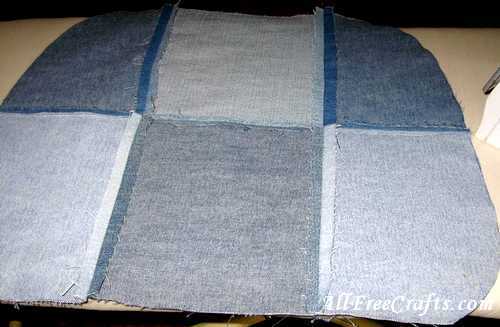 Volunteers at my local Mennonite thrift store sell bundles of eight-inch denim squares, enough to make a quilt top, cut from the blue jeans donated to their store that are just too far gone to sell as clothes. I bought a bundle or two of these squares, ahem, a few years ago. And it seems increasingly obvious that it will be a while before I make a denim quilt. 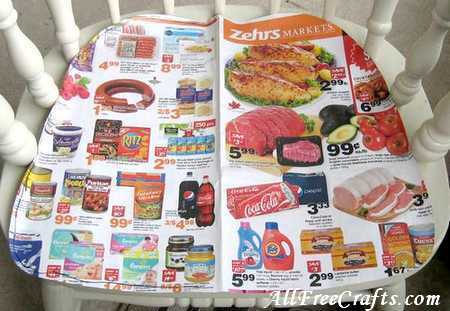 Meanwhile – I needed a dozen of the eight inch squares to make my rocking chair pad. So I snuck a few. 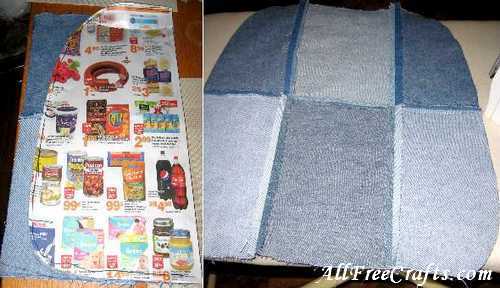 Assuming that (begged, borrowed or stolen), you have enough denim squares ready, let’s make some pieced denim fabric. In my case, the measurement from the back to the front of my pattern was more than 16 inches, but I figured that I could just about make it work, providing the center seam allowance was the smallest that I could manage. Therefore, I took two eight inch squares, put them right sides together, and sewed them together with a 1/4 inch seam allowance. I repeated this two more times, thus ending up with three strips of denim, each approximately 15-1/2 inches long. I sewed two of these strips, right sides together, using a 5/8 inch seam allowance. Then I added the last strip, also with a 5/8 inch seam allowance. After opening up and pressing all the seams flat, I had a pieced denim panel that was ready for my pattern. At this point, you could make the back with another piece of fabric, or make a matching pieced denim rectangle. Either way, the chair pad will be reversible. You have two choices here: either place the open pattern on the fabric, mark around it and cut out; or, fold both the pattern and the fabric in half, then set the pattern on the fabric, fold to fold, as shown here, mark around it and cut out. Repeat for the second piece of fabric. Denim isn’t a good choice for making thin straps. I concluded this after trying several times to make thin denim ties to secure the chair pad at the back. Believe me, it’s best to forget the denim and make tie straps from a coordinating color of thin fabric or ribbon. In the end, I used 3/4 inch strips torn from a delicately mottled blue cotton fabric. I followed this tutorial for sewing and turning thin straps and ended up with four straps, each about 12 inches long. Once each strap was sewn and turned, I just tucked in the ends and sewed across them to finish. Place one of your pieced pieces of denim onto the rocking chair, check the fit, and mark two spots at the back where you want the ties. I wanted to make two bows which would secure the chair pad to the back of the rocking chair, so I needed two ties for two spindles. I marked two spots on the fabric just in front of the two spindles, then pinned the ends of two straps, sitting right next to each other, to the front of the fabric. Sew back and forward across the straps a few times to secure them, being sure not to go beyond the seam allowance. Allow the other ends of the ties to fall across the front of the fabric. I pinned them down in the middle just to keep them out of the way while sewing. I had a fleece blanket with a ripped corner, so I used the rest of it to make three layers of fleece cut to fit my chair pad pattern. 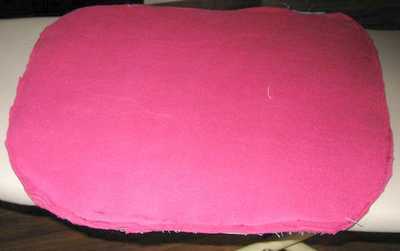 I decided to sew all three layers of fleece to the back of the chair pad fabric that was left without straps. First, I sewed all three layers of fleece together. 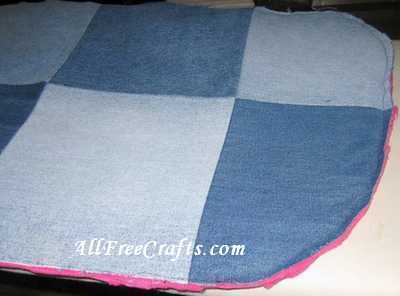 Then I pinned the fleece onto the back of the pieced denim fabric, then sewed all around the edge, using a 1/4 inch seam. I trimmed the seams to get rid of any excess material. More conventional padding can be done in a variety of ways. Lightweight quilt batting or upholstery foam can be cut to size, rolled up, then inserted into the pad cover after the sewing is done and the cover has been turned right side out. 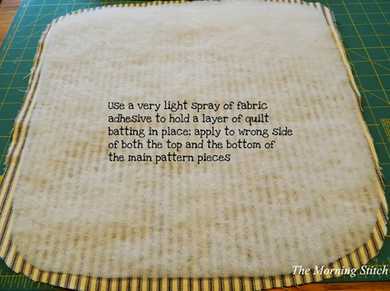 Or you can try the method used on the The Morning Stitch Chair Pad Tutorial, which I thought was rather clever. She cut batting smaller than her main fabric by the width of a seam allowance, then lightly sprayed the batting with fabric adhesive before laying it on the wrong side of the fabric. She did this for both the top and bottom pieces before sewing them together. Because she was designing the chair pad to be tufted with buttons, the cover was then further padded with fibre fill stuffing. This must be added in small, even amounts to prevent lumps. I think the two layers of quilt batting would help keep the inner addition of stuffing from moving around too much, also keeping things nice and even. I was asking a lot from my sewing machine, expecting it to cope with two layers of denim, plus three layers of fleece, but after lengthening the stitch and loosening the tension, I was able to get a consistent stitch all around, starting just before where my first set of straps were already sewn in and going all around the chair pad, ending just after the second set of straps, leaving a gap in the back seam to turn the pad right sides out. If you’re just working with the top and bottom pieces of pieced fabric, and putting in the padding later, this step should be relatively easy. Essentially, you will pin the bottom piece to the top and begin sewing your seam at the back, continuing all around, and finishing at least six inches away from your starting point. Use this gap to turn the piece right sides out. The straps should now appear at the back, ready for tying. If you’re adding padding now, roll up the quilt batting or foam and insert it through the opening, gently manipulating and moving it into place, until the cover is consistently flat and softly padded. Hand sew the opening closed in invisible ladder stitch. Place the chair pad into position and tie the straps in bows around the spindles. Now, the most satisfying step: grab a cup of your favourite beverage, a good book, and sit down in your rocking chair for a well deserved rest.